It's always interesting to watch rhetoric and negotiation posturing clash with reality. "Being a member of the European Union has a number of obligations... The Europe that we believe in is a pact of solidarity and that solidarity applies to all member states". Ministers from the 27 EU member states, plus Norway and Canada, are currently discussing the operation in Mali, with the Canadians seemingly more committed to 'European solidarity' than the Europeans given that they already have special forces on the ground. The Germans are providing cash, two transport planes and possibly some training personnel while Poland is likewise considering participating in the training operations, with a decision due by the end of the day. It might help if we were to be given a list of the obligations that comes with membership in the EU. Is sending soldiers to support foreign regimes one of them? Machiavelli wrote about states who relied on mercenaries and foreigners (rather than own citizens) to fight their battles for them. His view was that such states are doomed. Maybe that wasn't ever true or it is no longer true? I happen to believe that he was and is right about that. Country is almost overrun by rebels and Mali can afford to not have all their resources dedicated to fighting back? If what Machiavelli wrote is true, then Mali is doomed. 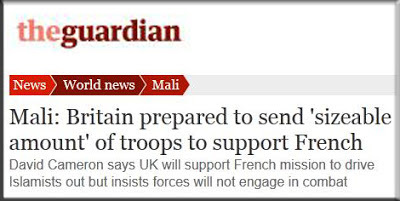 According to abc news, the UK has committed 400 troops to Mali. To me, that looks to be because we can do it. Germany would debate something like this for weeks and Italy is in the middle of an election. Meanwhile the UK can always deploy troops rather quickly. This proves the total incompetence and lack of solidarity. 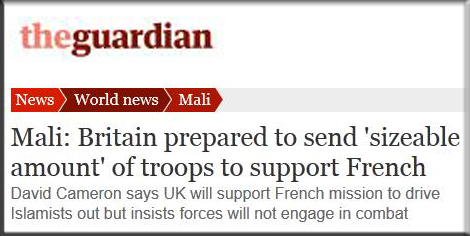 The UK is helping France unilaterally; so is Canada and the US. The EU is not worth a single penny. If evwer we put our defence into European hands it will be the end of our nation. When the chips are down, we need our friends. We need the EU like a fish needs a bicycle. Was it Mario Monti who predicted that Europe should have a military "fight the resource wars of the Twenty-first century"
An untimely scandal in the making for Rajoy? Spain back under the spotlight soon? "Single Market yes. Federal Europe No"
Will the EU follow France into the Malian desert? Is the SPD in crisis? A new angle to UK-EU trade? Cameron's EU speech: The only way is up?